There's been some talk about the idea of reprinting classic hardboiled and noirish westerns of the fifties and sixties. I compiled such a list earlier on my blog here (I called the list, jokingly, Hard Case Western) and the Spinetingler Mag maven Brian Lindenmuth has been talking about the same kind of westerns on his Facebook site. Only now I noticed that Stark House Press has started doing this. Earlier they reprinted three of Harry Whittington's noir westerns, and they reprinted one by Arnold Hano, the Lion Books editor, and now they've done a two-fer by Clifton Adams. This is incredible! I only hope I'd have more time on my hands. If anyone wants to work along these lines, the list I compiled can be used. I only wish my name would be mentioned somewhere. I didn't see this post-apocalyptic dragon film when it was new, and I got interested only after it had gotten some sort of a cult status. Well, I don't really know if it's really a cult film, but it has its admirers. I searched for the film, but quite haphazardly, didn't really go out for it. I would've watched it via some streaming site, but it doesn't seem to be available in Netflix, at least in the Finnish version. 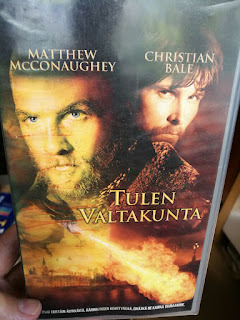 Finally I spotted the film on VHS for 10 cents in a thrift store. Reign of Fire, directed by TV specialist Rob Bowman, is about dragons set loose in London some time in the present time or in the near future. They destroy the world, and only a handful of people remain. These include Christian Bale (who as a kid was responsible for setting the dragons loose) and Matthew McConaughey, who is an American flying across the Atlantic to destroy the only male dragon. Everything is burned to ashes, and people are living in caves and other barbarian environments. The film doesn't make much sense (why does killing the male dragon help, when there are still hundreds of female dragons about? ), and it's way too serious about its subject matter, when I think it should be done firmly tongue in cheek. The script is not very smart, and only Bale and McConaughey are given something to work on, others are merely extras, which sadly goes also for Izabella Scorupco, who's an flying assistant to McConaughey. But Reign of Fire was still somewhat entertaining. I'm glad I watched it, but I do hope it would've been better. This didn't become my guilty pleasure.